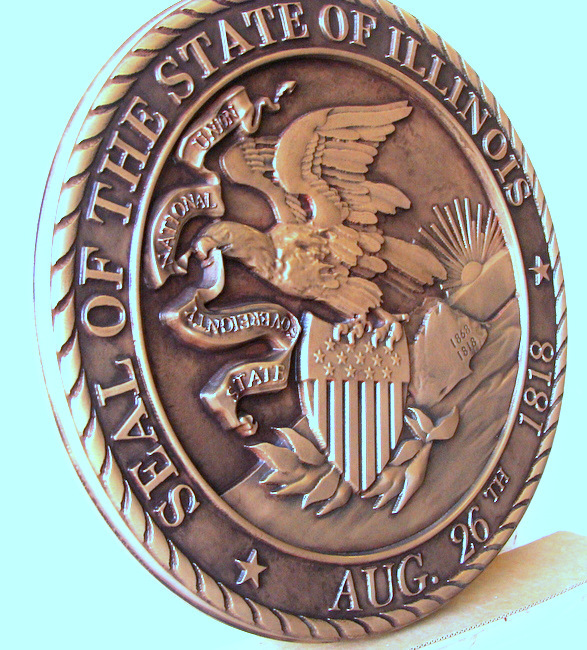 Above is a photo the left side view of a bronze-coated 3D carved HDU Great Seal of the State of illinois. The text and art on this plaque is hi-polished bronze and the background is dark patina. Please click on Product Gallery 7 to see 100 other bronze, brass, copper, gold, silver, silver-nickel (German silver), stainless steel and aluminum plaques and signs. We make custom & personalized metal and metal-coated round, rectangular, shield, and other shape wall plaques of all of the great seals, emblems, logos, badges, medals, insignia, and patches for any branch, department, agency or other organization of the US Federal, State, county and city governments and their various departments, agencies, etc., (especially courts), as well as professional offices (attorneys, doctors, CPAs, etc. ), colleges, companies, stores, cemeteries, memorials, churches, and residences. We can make a 2.5D (flat relief) or 3D carved and sculptured bas-relief (1/2 to 1 1/2 inch elevation relief ) metal-coated High-Density-Urethane wall plaque of any design in any size from 12 inches to 8 feet, for either indoor or outdoor use. Typical sizes are 18 , 24, and 36 inches in diameter. Metal coating types include bronze, brass, copper, silver-nickel, aluminum, stainless steel, gold, and silver (the latter two are leaf gilded rather than liquid metal coated). We can customize or personalize these plaques with carved raised or engraved text for individual or organization names, achievements, citations, dates, etc. These are suitable for outside building entrances, memorials ,informational displays, dedications, and also inside lobby or reception areas, hallways, courtrooms, conference rooms, offices, auditoriums, and podiums. We also make metal plaques for employee or citizen recognition, award, achievement, service , or retirement. The surface of a plaque or sign can also be finished in combination of metal coatings/gilding/paint and full color paint or a variety of natural wood finishes (see M7000 to M7000C and M7002 in this Gallery 7). Most of the plaques in this Gallery can use this wide selection of color and surface finish choices. Please click on Gallery 30 to see designs for Federal government plaques, including versions of the US Great Seal. Our State government plaques are shown in Gallery 32 To see other Photo Gallery pages for great seals, including the US military branches (Gallery 31), Counties and Cities (Gallery 33), Universities & Colleges (Gallery 34), and companies, clubs and sport teams (Gallery 35), please click on one of the numbered gray boxes in the lower left margin of this page . To see prices or get Estimate and order forms , click on gray boxes in upper left margin. Click on dark gray tabs on the header to see Home and other informational pages.